Nitrate occurs naturally in your aquarium as a byproduct of the breakdown of waste, be it feces, uneaten food or decaying organic matter. When too much is present in your tank's water, this chemical compound can be toxic to your fish and other life. Also, algae like nitrate because it fuels their growth. If your regular water testing confirms high nitrate levels, take action to remove the excess before it jeopardizes your aquarium system. 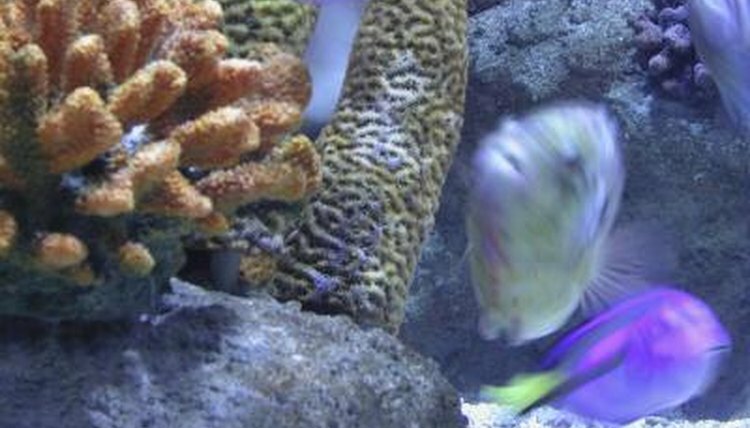 Generally, in a fish-only aquarium, aim for a nitrate level under 20 parts per million, or ppm. If you also have invertebrates in your aquarium, though, you typically have to keep your nitrates below 5 ppm. Reef setups should definitely not exceed nitrate levels higher than 1.0 ppm, but often closer to 0.5 or below. These are guidelines, not hard-and-fast rules. Do some homework on the specific types of life you keep in your tank to determine a more definitive target level. Your aquatic ecosystem depends on relatively steady water chemistry. The nitrate levels, along with most other aspects of the water makeup, need to remain consistent for the health of everything living in it. Sudden considerable changes to any readings -- from temperature to ammonia to carbon dioxide to nitrates and other levels -- stress tank life and can be fatal when severe or when particularly sensitive species are present. Employ only one effort to remove high nitrates per day, or wait a few day between tactics if your levels aren't dangerously elevated, to bring down levels gradually and avoid shocking anyone or anything living in the aquarium. Start with a standard 10 to 15 percent partial water change. The new water is lower in nitrates, so begins to balance the ecosystem. Also, make sure your filter and protein skimmer are plugged in and properly functioning. Clean out their trays and perform any manufacturer-recommended maintenance if it's due. When they're functioning well, these accessories remove debris that releases nitrates and other compounds. Because excess food, fish waste and deceased life give off nitrates, thoroughly check your tank for dead critters or plants and remove them, vacuum the substrate and run your net through the water. Fish and pet supply stores stock various products called denitrators that remove nitrates from water. Different products work in different ways and have different effects on water chemistry, so get a recommendation from a trusted source. Also, test your water daily for a few days to monitor the product's effects. Follow package directions carefully to avoid drastic drops in nitrate levels. A more natural option is to add cured live rock or live sand into your tank. These contain microorganisms that eat nitrates in the water. Products called "biopellets" are also available that house these microscopic lifeforms; they're released when the pellets dissolve in the tank water.